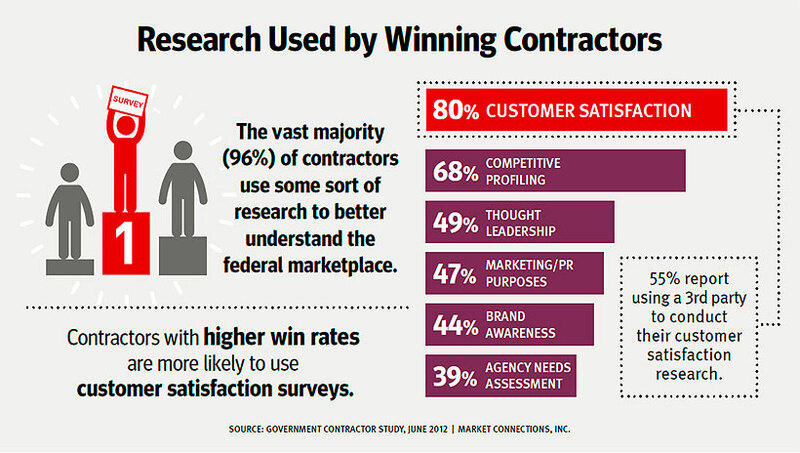 In 2012, Market Connections conducted a sur vey of government contractors to find out what drives their marketing efforts, including contract retention. We have found that the key takeaways are still relevant—perhaps even more so—in today’s federal market. The study found that relationships are paramount, and that efforts to foster customer relationships are well worth the investment. These efforts include conducting research to learn details of customer preferences, needs and requirements. And contractors that conduct customer satisfaction research reported higher win rates than contractors who do not invest in this type of research. Customer satisfaction research is a powerful tool. Agile Defense, an IT services firm with a number of federal clients, is one example of a company successfully using customer satisfaction research to nurture relationships and foster continuous improvement internally. FedPulse spoke with President and CEO Jay Lee about the drivers behind using customer satisfaction research, why Agile Defense chose to work with a third party research firm and what they learned in the process. Q: What prompted you to conduct customer satisfaction research? A: We’re a small business, and at the end of 2013 when we decided to conduct customer satisfaction research, we had been in business for 15 years. As a smaller contractor, all we have is our reputation. Our culture is founded on the belief that if employees are happy, then customers will be engaged and that will lead to contract retention and more new contract wins. We have always been strong with measuring employee satisfaction, but had never conducted customer satisfaction research. But in 2013, we’d had a few situations arise where we felt unbiased feedback would be useful in helping us address them. Q: Why not rely on the results of your CPARS evaluations? A: Although conducted annually, the Contractor Performance Assessment Reporting System (CPARS) have very loose deadlines—making them a very lagging indicator of customer satisfaction. And in instances where we are a subcontractor, there is no requirement for CPARS at all. We wanted current information that we could act on immediately. Q: Why did you choose to use a third-party research firm? Q: Were there any surprises in the research? A: The detailed comments our customers supplied were a pleasant surprise. We know how busy they are, and weren’t expecting them to provide much depth in their comments. But they did, and those insights gave us a tremendous amount of actionable data. In terms of outcomes, there were some areas where we thought we were doing better and others where our clients rated us higher than we thought—that in and of itself made doing this research worthwhile. Overall, our scores were very high (and higher than industry averages), and we were happy about that. But we also got feedback that has helped us on our quest for continuous improvement. We do have limited dollars and resources—this research helped us prioritize where to make changes. Q: You conducted the first customer satisfaction research almost one year ago. Have you been able to make any adjustments to your services with the information? A: It’s not so much that we needed to make any changes in our services, but enhance what we were already doing. In addition to that, this research has been the catalyst for open conversations with our customers—and that has strengthened our relationships with them. Soon we will find out the real impact of this as we are conducting a follow up survey now, and are eager to see if we can get those scores even higher. A: We are thrilled to now have data to correlate with our employee happiness metrics – helping us prove that employee happiness does in fact, for us, yield customer satisfaction. Having gone through this process, I cannot stress enough how important it is to use an experienced, third-party research firm. The unbiased results and benchmark data are invaluable assets to our business. It is an investment well worth making. Learn more about the benefits of Customer Satisfaction Research.